Contains the five major fuel hoses and lines in the front area of the engine. Three nylon/plastic lines and two rubber hoses. The white nylon lines include the horseshoe-shaped retainer clips, where required. The fuel return hose that links the five injectors is not included and is shown below. THIS KIT INCLUDES PREPAID SHIPPING TO ANY U.S. ZIP CODE. DO NOT ORDER THIS KIT FOR SHIPMENT OUTSIDE THE USA. Kit includes two standard Meyle rotors, two wear sensors & four Brembo ceramic brake pads and slide pin lubricant. THIS KIT WILL ONLY FIT MODELS WITH 15 INCH WHEELS. Measure your rotor diameter, if in doubt, as these rotors are 276mm in diameter. Kit includes two rotors, two wear sensors & four brake pads. 2 to 3 Day Shipping to any US Zip Code included! Not valid for shipping outside the USA. 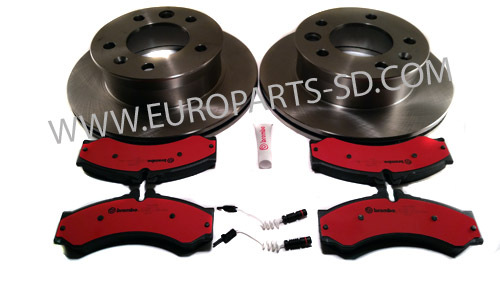 Kit includes two rotors, two wear sensors & four Brembo ceramic brake pads and slide pin lubricant. Measure your rotor diameter, if in doubt, as these rotors are 285mm in diameter. 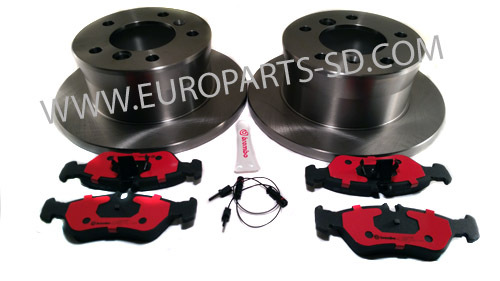 The rotors in this kit will not fit any Sprinter originally equipped with 15" wheels. 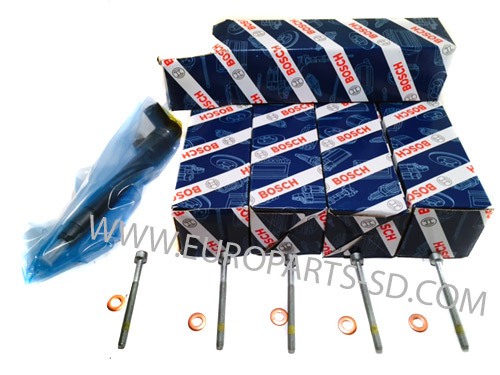 Set of all four shock absorbers, made by BILSTEIN in Europe. 2-Day Shipping to any US Zip Code included! This item, due to the overall weight, cannot be shipped outside the US. Unless you are shipping to a US Zip Code, do not order this kit. 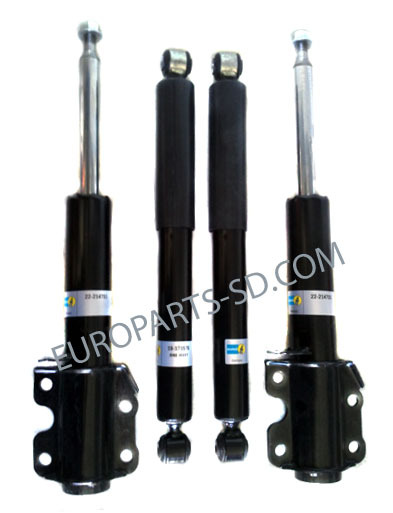 Set of all four shock absorbers, made by KYB in Europe. Sprinter 2500, fits all models with both 15" and 16" wheels. Both lower ball joints with shipping. Oil is Mercedes Benz approved Spec. 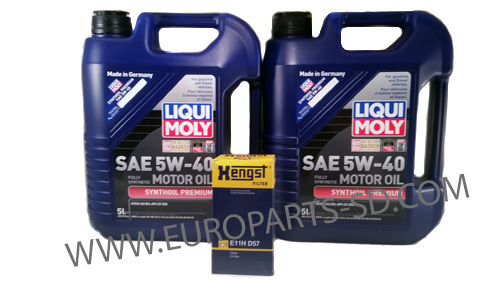 229.3 Synthetic Fuchs oils are new vehicle, factory fill in Germany. Complete kit, includes both left and right tie rod assemblies, both boot kits and Priority Mail 2-3 Day shipping to any US Zip code. These kits are only for shipping to a US address. If you reside outside the US, order the parts individually. 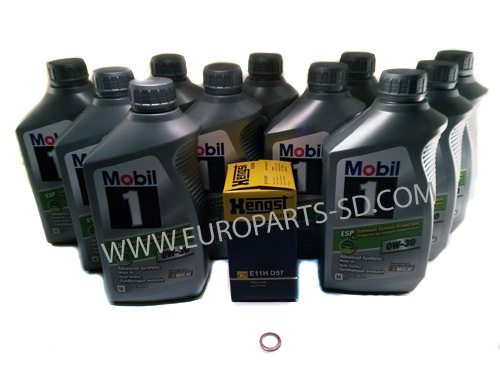 Complete kit for all 2002-2006 five cylinder diesels. 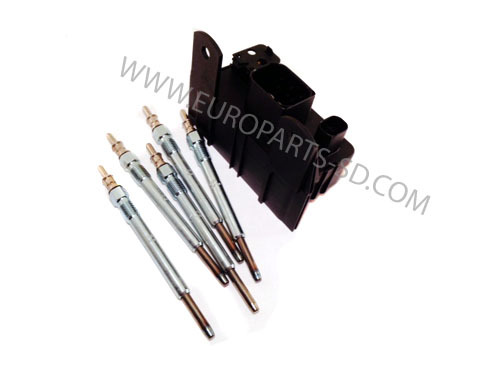 1 x Glow Plug Control Unit from Wehrleh, the OEM supplier to Mercedes. This kit contains the newest (third revision) and most current version of the control unit. It is smaller than the earlier unit and has automatic circuit breaker type reset, unlike the first units that came with the vehicles, when new. The original units had internal fusible links that would burn out and the entire unit had to be replaced. Contains five major fuel hoses in the front area of the engine. Complete Kit.....Version 1 , which has two of the larger grooved idler pulleys.. This kit is comprised of all original equipment replacement parts, a Conti-Tech belt, Litens tensioner and two INA pulleys. All parts are the exact same units sold by a Sprinter franchise dealer. 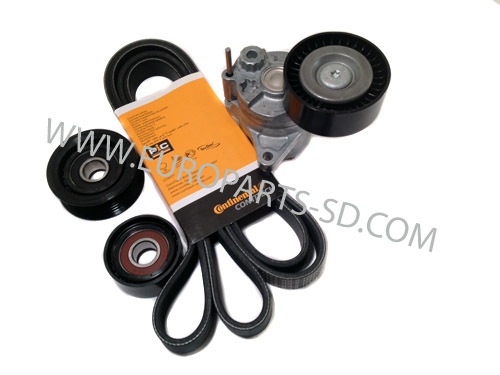 See version 2 belt kit below, which has one smaller smooth pulley and one larger grooved pulley. Either kit will perform fine in your vehicle, the choice is yours. 2-3 Day Shipping to any US Zip Code included! This kit is only for shipping to a USA address. 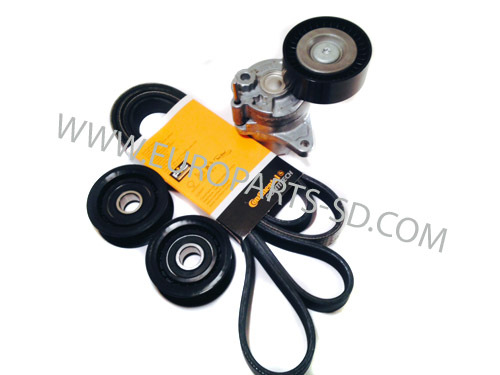 Complete version 2 kit, which has one smaller smooth idler pulley and one of the larger grooved pulleys. We have added this kit at the request of several customers who wish to use the smaller, smooth upper pulley and the larger ribbed lower pulley. Either kit will perform fine in your 2004-2006 Sprinter, the choice is yours.